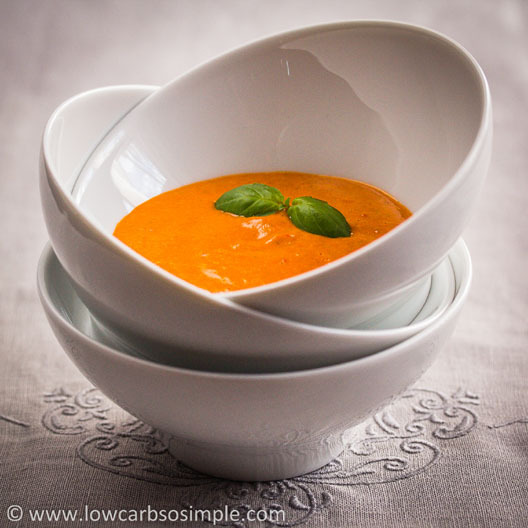 Appetizer Soup from Red Bell Pepper, Garlic and Basil | Low-Carb, So Simple! -- gluten-free, sugar-free recipes with 5 ingredients or less | Low-Carb, So Simple! This is an easy soup to make. Just chop all the veggies and place them in a large saucepan with salt and heavy cream. Bring to a boil and let simmer until everything is soft and tender. Keep the lid closed and mix a few times during the whole cooking time. I recommend a large saucepan, because the heavy cream tends to boil over when you keep the lid closed. And, it’s a good idea to keep the lid closed, since that guarantees the proper and faster cooking of the veggies. The amount of fluid doesn’t reduce too much either. If the basil has woody stems, simply discard the stems and use just leaves. This soup benefits from an ample amount of basil, so don’t skimp on it. If you consider the puréed soup too thick, simply return the soup back to the saucepan, add some heavy cream, mix well and bring to a boil. Let simmer for a minute or two, then just serve. …mix well and bring to a boil. Cover and let simmer for 30 minutes, or until all the vegetables are very tender. Purée the soup really smooth for example in blender or with immersion blender. Be careful with the hot soup! Rinse the bell peppers, pat dry, halve and discard the seeds. Chop the flesh into small pieces. Chop the basil into tiny pieces. Let simmer, covered, over medium-low heat for 30 minutes, or until all the veggies are soft and tender. Remove from the heat and purée the soup until very smooth. I realized that I haven’t published a single soup recipe, even I make soup relatively often. I checked my notes and found this one, which I had made in the beginning of the summer when we had plenty of red bell peppers and I didn’t know what to do with them. I simply thought red bell peppers would make a great, colorful and tasty soup. I desired to add some more basic but intensive flavors: garlic and basil. I didn’t want to mix together too many flavors, however I thought garlic and basil would complement the flavor of bell pepper beautifully. My aim was soup full of intense flavors, but I didn’t care for too spicy soup. Salt was enough to spice and season the soup, though I imagined a pinch of chili to give a warm note especially during wintertime. I rounded the flavors with heavy cream, which worked also as fluid for the soup. I was thinking of using sour cream, too, but I thought its sour note wouldn’t suit here that well — maybe just a little swirl of sour cream would be nice as garnish. I cooked all the ingredients until they were soft. Nevertheless, I wasn’t happy with the texture: the pieces of basil and bell pepper were disturbing. I got the idea to purée the soup. Wonderful! The flavor was rich and intensive, the texture smooth and velvety. The color was beautiful, bright orange. I was really surprised that with the first try the result was so good. Later — when I wanted to test and perfect the recipe — I increased the amount of garlic to 10 cloves. However, that brought too much garlic flavor in my opinion. 5 cloves was the ideal amount for me and my family. You can spice up this soup with chili, but I don’t recommend to make the soup too spicy. As appetizer soup this little goodie is meant to wake up your senses and your appetite, not to numb your taste buds. If you are a serious garlic lover, you can add up to 10 garlic cloves — or even more. If you want to make the intense flavor milder, you can add sour cream or whipped cream as a decorative swirl on top of each serving. You can make the soup more filling by adding one peeled and chopped hard-cooked egg per serving. Serve the soup for example as lunch with nice salad. If bell pepper doesn’t belong to your favorites, you can simply replace it with tomatoes. They suit also extremely well this hearty soup. It’s a good idea to blanch the tomatoes and remove the skin before cooking. You can garnish the tomato soup with chopped mozzarella, although that hard-cooked egg is also fine. Another great idea is to serve tiny servings of this soup as amuse-bouches in bigger parties.